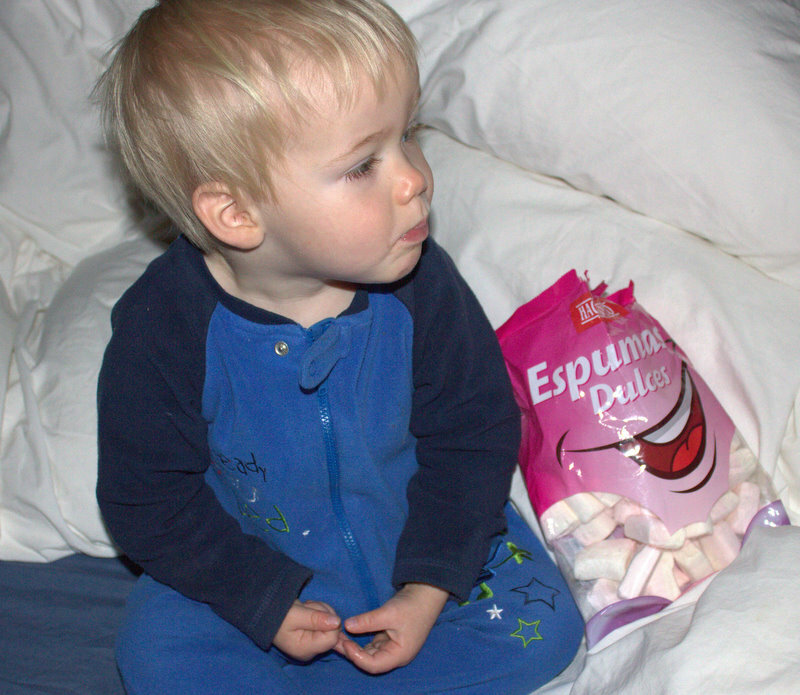 The 25th January was Richie’s birthday and after a nutritious breakfast of flumps (Jack’s marshmallowy and only ever so-slightly self-interested birthday present to his father) the day progressed into a galloping gourmand gourmet odyssey. 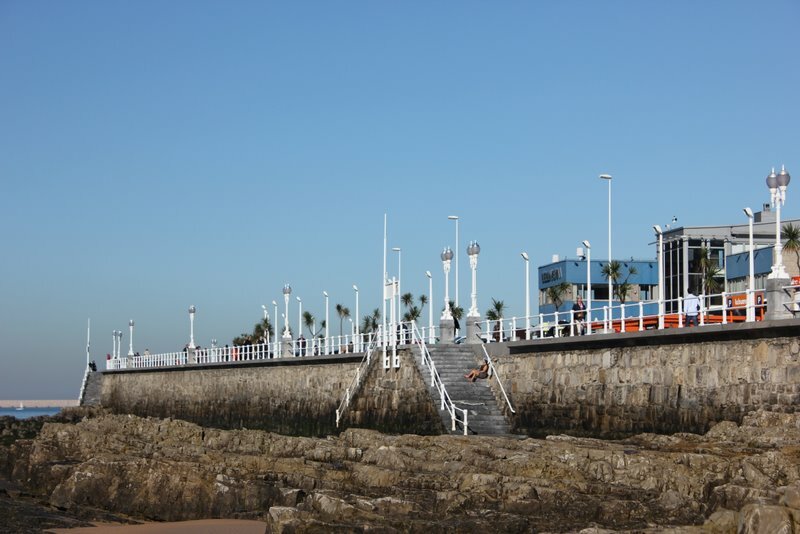 It was a gloriously sunny day as we headed to Gijon, which with its beaches, restaurants and the best play park ever, satisfied all members of our (birthday) party. From the beach, our attention was drawn to ‘La Bella Vista’ resturant (the blue one on the end in the photo above.) With a gorgeous terrace shimmering in the January sunlight and very ‘bella’ views across the bay to the old quarter of town, it seemed like the perfect spot to celebrate. A quick check of the menu on display by the gate confirmed that this was an upmarket joint with a menu selection that gave an inventive twist to traditional Asturian fare. Prices were correspondingly on the slightly sophisticated side but just enough so that we could feel like we were celebrating in style without risking bankruptcy. 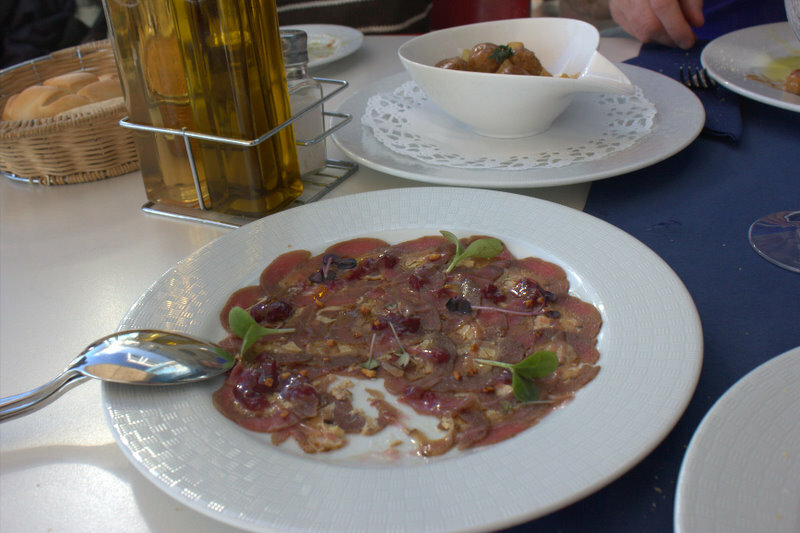 The ‘Menu del Dia’ lunchtime formula option was priced at 14 Euros for three courses with wine/cider (weekday ‘menu’ price in Gijon ranges between 7 to 15 euros) but we threw caution to the wind and went a la carte. The birthday boy had a yen for octopus (nothing new there – pulpo, as it’s called in Spanish, is a firm family favourite). As the only such dish was ‘pulpo a la brasa’ in the ‘to share’ section we naturally plumped for that for starters. At 16 euros for the portion it a) seemed rather pricey and b) just wasn’t going to satisfy our penchant for pulpo. 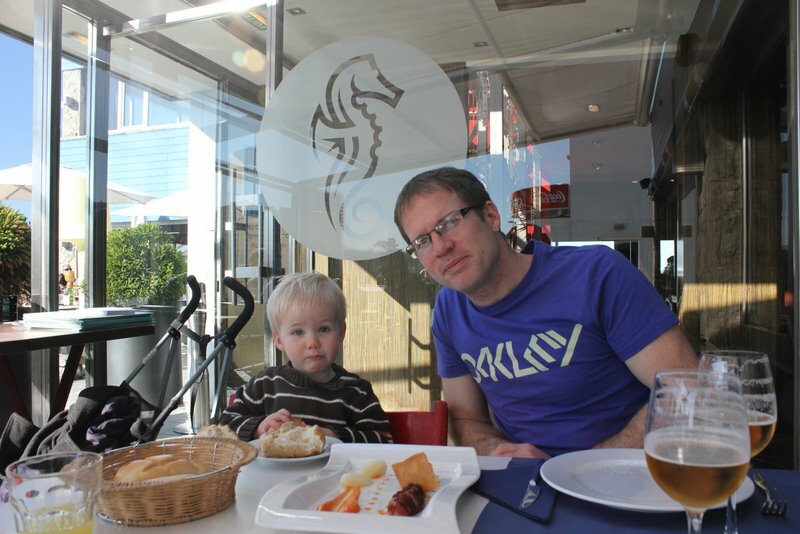 We skipped dessert – mainly due to a crabby toddler who needed his post-prandial siesta (soooo Spanish, I’m telling you). Discretion being the better part of valour we beat a hasty retreat to the promenade where Jack soon nodded off in his pushchair. 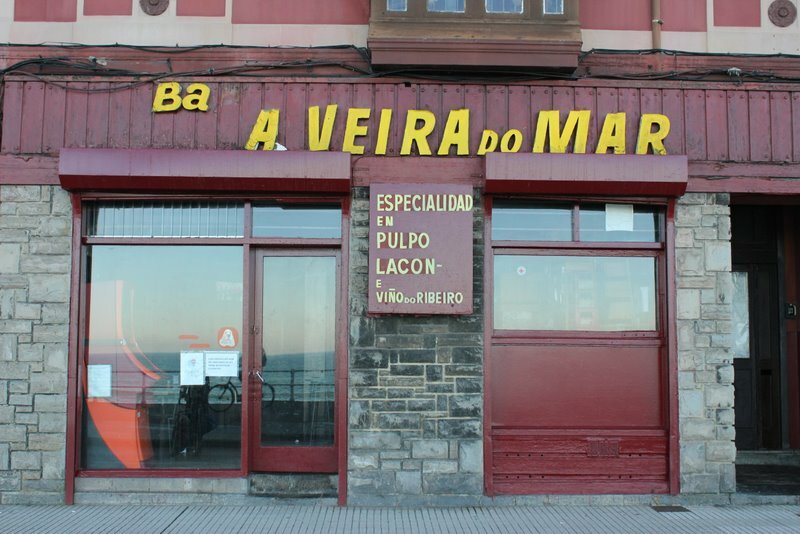 A meander along the seafront brought us face to face with the dilapidated looking Galician Bar-Restaurant which we had previously pondered over as a dining destination, being, as it is, a dedicated pulpo restaurant. We caught each other’s eye. We couldn’t, could we? Well, it was his birthday…. Never mind the rundown exterior – it’s a pulpo palace! The last lunchtime patrons were leaving the bar as we entered. The floor beneath the counter bore testament to the passage of a busy lunch service – hundreds of cider spattered napkins and toothpicks littered the floor. An excellent omen. The frontage may be past its best but if the diners keep coming the food must be good. We ordered a restrained half portion of pulpo gallega (priced at 9 euros, with a full portion at 16) and when it came, unlike its tentacled colleague from earlier in the day, it did not disappoint. It was a mound of succulent, olive oiled, rock-salted, juicy octopus. Perfect! Finally satisfied we headed for home. If there’s one thing about getting older, you sure do know exactly what you want and, if you’re lucky, how to get it.